Do I Amuse You? — UNSUNG BREWING CO.
My wife and I have been enjoying pizza from this establishment for quite some time now. So, you could imagine my excitement when I realized they are HUGE supporters of local craft beer! In fact, the Yorba Linda location only serves beer made in Orange County! I had the opportunity to meet the hard working folks behind the pizza slingin restaurant to discuss beer and pizza. It was a pretty simple conversation. They like our beer and we like their pizza. 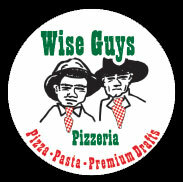 Wise Guys graciously invited us to participate in a "Pint Night" at the Yorba Linda location Tuesday January 26th at 6:00pm! We will be pouring "Buzzman", "Anthia", and our newest addition to the beer family, Propeller Head (kegged today). We look forward to meeting the customers who believe beer and pizza are great alone, but even better together! Come out and meet us to learn about our beer and why we love what we do! See you in two weeks for another pint night at the Wise Guys Orange location. Drink Local! Eat Local!